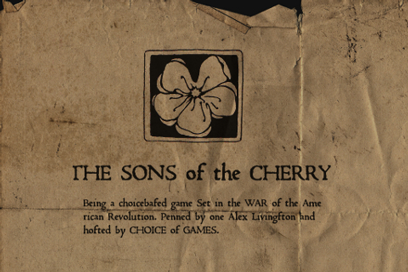 Choice of Games is pleased to announce the release of Sons of the Cherry, by Alex Livingston, author of The Nightmare Maze. Play it on the web, or download the iPhone version or the Android version. “Sons of the Cherry” is a game of espionage and arcane magic in the American Revolution. Choose a side or go it alone in the secret war for the soul of the new nation. Use multiple magic disciplines to reach your goals and change history. Both “Sons of the Cherry” and “The Nightmare Maze” are part of Alex’s Waking Cassandra series, which now includes two multiple-choice games, a comic book, and a stage play. You may also recognize “Sons of the Cherry” as an entrant in the 2010 IFComp. (At that time, the game was available only on the web.) The new version of the game incorporates feedback from IFComp reviewers. We hope you enjoy playing “Sons of the Cherry” and we encourage you to play it, tell your friends, and to recommend it on StumbleUpon, Facebook, Twitter, and other sites. Don’t forget: our initial download rate determines our App Store ranking. Basically, the more times you download in the first week, the better “Sons of the Cherry” will rank. Finally, a shameless plug: “Sons of the Cherry” is another game available as part of our hosted games plan. If you’d like to write a multiple-choice game of your own, give it a try! If you host our game with us, we’ll share a portion of the revenue that the game produces with you. Kindle version please!!! 🙂 It looks great!